Myasnitskaya, 37 (m. “Chistye Prudy”), tel . : 915-8383. Mode of operation: Sun. –Th. In the wing of the old Moscow manor, designer Yuna Megre harmoniously built the interior of a European country house of the 50s: wicker furniture, shelves with homemade blanks, a basket with kittens, a real fireplace, firewood and other rural delights. Countless knick-knacks that create a surprisingly cozy atmosphere were found by the founders of the restaurant in European bazaars: Belgian clockwork toys, porcelain cats were attached to the shelves and dressers, carved frames with faded photos, and well-worn scales. There is an old, but working gramophone. In a small two-story house four rooms, plus a spacious veranda, which is open all year round. Grandfather Pihto — another cozy restaurant from the syndicate Ginza project: with home cooking, affordable prices, large portions and friendly staff. Chef Alexander Lokhin appreciates simple recipes and clear tastes: everything is at home with his grandmother. 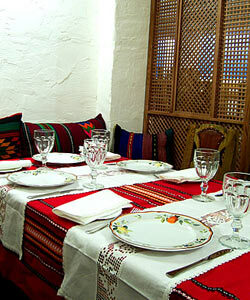 The restaurant holds master classes on cooking all sorts of homemade delicacies. The invited star, with the active help of the chef, teaches the guests to make sea-buckthorn jam, paradise apples or make orange-ginger jam, bake lush pancakes and cook the main English dish — roast beef. Participation in master classes is free. In the volumetric menu, Russian and European dishes are combined, and all of them are exclusively homemade. Foods that best describe the word “tasty” come out of the hands of the chef: there are a lot of shrimps in the Caesar, only porcini mushrooms in the mushroom soup, and the fettuccine is generously flavored with stewed duck. In the kitchen of «Grandfather Pihto» they make jam, bake pies, prepare cranberry juice and compote from dried fruits, make cherry liqueur and hot horseradish. Average score — 1000 rubles. Myasnitskaya, 47 (m. «Red Gate»), tel . : 725-0333. Atmosphere and interior. Restaurant interior Misato based on three elements: it has a lot of water, trees and stones. And no high-tech, characteristic of the metropolitan institutions of Japanese cuisine. From the street Misato seems to be a one-story room in an ordinary house. In fact, this house is not just a house, but the first building in Russia entirely built of concrete, and a three-level restaurant. At the bottom reigns a romantic atmosphere: dim lights, a pond with fish, a fountain, there is a tepan — the chef cooks in front of guests. 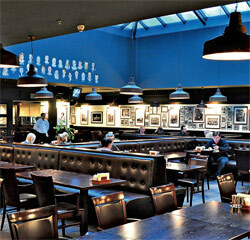 The middle floor is universal: European arrangement of tables, more light, a bar. On the top there are separate rooms, ideal for negotiations, of which there are two rooms with tatami. Chef and institution concept. Misato — A restaurant authentic, which means expensive Japanese cuisine. There are no compromises: the chef Munechika Ban is, of course, Japanese, the products are naturally high-quality. For example, lobsters and sea urchins are kept in an aquarium with sea water. Special offers. The restaurant works Sushi School Munechika Ban. The pupils, along with the chef, prepare sushi, rolls, then taste them, as well as dishes from a special menu (miso soup, scrambled eggs with vegetables and seafood, hot to choose from, dessert and green tea). Master class can be ordered on any day. Price (with lunch) — 6500 rub. for two. Kitchen. 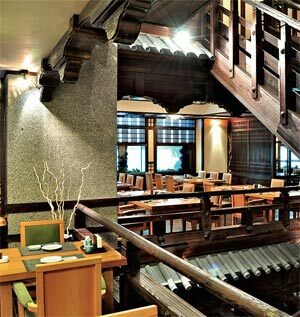 The restaurant’s menu is extensive — more than 200 Japanese dishes, which are divided into thematic sections. Among the well-known «California» rolls and sushi with scallops are many rarities: sushi with marbled beef that melts in your mouth, gunkans with sea urchin caviar living in a restaurant, a steam omelet with seafood and sake, just caught lobster. Average score — 3000 rubles. Seleznevskaya 19/2 (metro station Novoslobodskaya), tel . : 258-4403. Mode of operation: Mon.– Sun. Atmosphere and interior. Exactly Carre blanc in the early 2000s brought to Moscow the knowledge of real french cuisine. In 2010, the creators of “White Square” decided to talk about what a real French restaurant is. Today Carre blanc — this is a cocktail Drunk bar with soft sofas, sports broadcasts and a designer fireplace; home brasserie Le petit carre with closely spaced tables and a 15% discount on the entire menu; strict main hall with huge windows and classic serving; laconic tasting room «Malevich»; well-equipped wine cellar; green cozy veranda. Squares harmoniously fit into the interiors of each hall. Chef and institution concept. Eric Le Provo, who opened the restaurant in 2001, is responsible for the variety of dishes (high French cuisine, author’s masterpieces and home cooking). The chef’s credo is a harmonious combination of ingredients: the dish should be quite complex, but with a full flavor composition. Special offers. On Tuesdays and Thursdays — classes in the culinary school. In a specially equipped room, the chef teaches cooking French dishes — hot and dessert. Classes end with wine tasting, and sommelier picks wine to the dishes. Kitchen. In all halls of the restaurant there is a single menu. Opens his Formula offers for lunchtime. This is followed by the «Main Menu» with the author’s dishes and positions of high French cuisine. The section “French traditions” is devoted to onion soup, blood sausage stuffed with snails and other specialties. 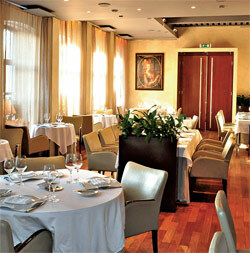 The «Offer from the chef» includes sophisticated dishes from expensive products. Average score — 2000 rubles. Trubnaya Square, 2 (metro station “Trubnaya”), tel . : 775-9888. In total, nine steak house restaurants operate in Moscow. Goodman, several more points are open in London, Kiev and Novosibirsk. But precisely in Goodmane Trubnaya Square often hosts free cooking classes. The interior of this restaurant retains the overall style of the network — solid, comfortable, comfortable: leather sofas, dark wood, forged lamps, as well as an area with soft sofas and coffee tables. Restaurants Network Goodman Although they are classic steakhouse houses, they cannot be called purely American, “cowboy” establishments. It is rather a respectable Wall Street. Vyacheslav Delberg, the brand chef of the chain, says: “Our strong point is simplicity and quality. It serves excellent meat with the right wines and harmonious side dishes. Special offers. For those who want to learn the basics of the profession of a cook, there is a paid cooking academy (courses: meat, fish, Italian cuisine). Free classes are organized several times a month: first the theory, then the volunteers with the chef prepare a snack and a hot meal, and the sommelier conducts a wine tasting. Kitchen. Menus in restaurants of the chain Goodman single. And from year to year it remains unchanged: only the best steaks and time-tested meat dishes, plus vegetable side dishes and a couple of international salads and appetizers. In addition to meat, fish and seafood are cooked here. Average score — 1650 rubles. Dolgorukovskaya ul., 19/7 (metro station Novoslobodskaya), tel . : 721-8899. New restaurant La serenata — a three-storey mansion, each floor has its own atmosphere. The first one has a cozy cafe for light lunches and coffee and tiramisu gatherings: here are musical instruments and notes hanging on the walls. The second floor is designed more for long dinners, when everyone is watching the chef working in the open kitchen. The third, mansard floor is equipped with karaoke. The color scheme for the entire restaurant is the same: cream walls, snow-white tablecloths, light wooden furniture. Perhaps there are not enough bold details, bright strokes. Perhaps this will appear later. The restaurant’s menu contains all the Italian classics, flavored with a substantial portion of the author’s taste of chef Pietro Rongoni and seasoned with his many years of experience in Italian restaurants in Moscow. Pietro is ready to hold cooking classes almost daily — if you would like to learn how to cook pasta and bake pizza. The guest orders a dish and expresses a desire to learn how to cook it, the cook goes into the hall and arranges an open lesson. Plans culinary classes for children on weekends. In the menu, recipes from all regions. And since in Italy each region boasts an abundance of excellent dishes, it turned out to be huge — one paste of 20 positions. Average score — 1200 rubles. Gogol Blvd., 8 (m. «Kropotkinskaya»), tel . : (495) 232-9209. Baba Marta — the only Bulgarian restaurant in Moscow. It is named after the most cheerful and hospitable Bulgarian holiday dedicated to the arrival of spring. 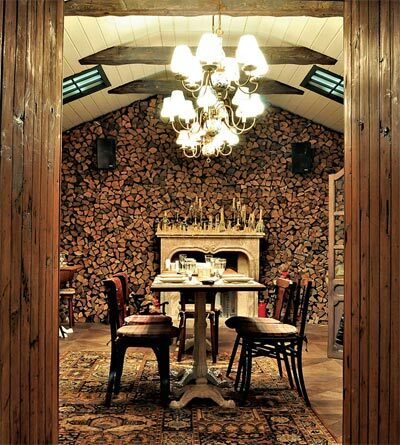 The restaurant’s interior is made in the national style: massive wooden furniture, embroidered tablecloths, homespun floor mats, earthenware krynki, snow-white fireplace. Plus to all — perky Balkan music. Chef and institution concept. 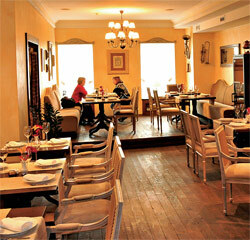 Chef Baba Martha — Bulgarian Milka Ruseva — offers guests large, truly generous portions of national Bulgarian dishes. It is worth visiting here, and it seems that now there will be some very real Balkan grandmother Martha, who has been standing at the stove all day to indulge the household with something tasty, homemade. Every Saturday at 14-00 in the restaurant Baba Marta pass children’s workshops. Chef Baba Martha Milka Ruseva holds cooking games, during which little gourmets learn to cook. In addition, two sundays per month at 12-00 there are great culinary and gastronomic holidays for the whole family, where children together with their parents, the whole family, learn to cook some tasty and simple Bulgarian dish, as well as participate in peculiar culinary fights. Holidays end with a fun meal together. The dishes of the Bulgarian cuisine that are served in the restaurant are shop salads, bani pie, pancakes, pancakes, baked lamb (Agneshko Pechene), pork kebab (pig sword), gible soup (shkembe chorba), cold soup tarator and real homemade yogurt (sourly mlyako).